mdwindustrialsupply.com is committed to customer satisfaction, so please review our return policy carefully. We want to make your online shopping experience as easy as possible so you'll continue to choose us for your green building supply needs. To keep prices as low as possible, we ship most products directly to you from the manufacturer. Therefore, we have to adhere to our vendors return policies and procedures. Important! Please inspect your order immediately after receiving and carefully check for damages and order accuracy. Please report any discrepancies or damages as soon as possible. In some occasions, you may receive separate shipments if products were ordered from multiple manufacturers. If your product(s) are damaged in shipment- DO NOT ACCEPT IT; please refuse shipment from the carrier. We will arrange to have replacement material shipped out to you at no cost. If you have accepted a delivery that has concealed damage, you must call us within 24 hours of receipt of material. All damaged material must be held for inspection by the carrier. The customer is responsible for all freight claims resulting from damage in transit if they accept the material from the carrier without noting such on the freight bill. Processing Returns: Please take time to carefully select your products when ordering on our website. We have created special configuration tools and have added technical data to help make your product selection easier. While most of our products are returnable (restocking fees apply), our custom products and special order are non-returnable. To quickly process your return, please email us. Have your order # ready and details about why you are returning the product (damage, order error, etc.). One of our Customer Service Associates will provide you with a return authorization number. This return authorization number (RA#) must be written clearly on the return address label or the label supplied on the packing slip. Return authorization requests should be made within 10 days of the order date. We will not accept returns without a pre-approved return authorization number (RA#). Returns are broken down into two categories. Damaged Goods/Company Error/Manufacturer's Defect and Customer Error. You must obtain a return authorization number (RA#) for any of the return categories. Customer Error/Cancellation/Returns Returns will not be accepted after 30 Days. A restocking fee of 25% will be applied to all returns that are a result of customer error or order cancellation. Original shipping costs will not be refunded. Custom configured or special order products are non-returnable. Customer will be responsible for all return shipping fees, packaging, and processing costs. Orders returned within 30 days will be credited the invoice amount LESS the original shipping costs and associated fees. Customer is responsible for acceptable repackaging of all returns mdwindustrialsupply.com will not be responsible for return shipments lost or damaged that are returned by customers. Damaged Goods/Company Error/Manufacturer's Defect Returns will not be accepted after 30 Days. Orders returned within 30 days will be credited 100% of the invoiced amount, minus freight. If your order was shipped via UPS, mdwindustrialsupply.com will contact UPS for pick-up. UPS will arrive within 5 business days to pick up the order. The UPS pickup tag will have all return address information. Do not attempt to give the return package to your regular UPS driver. UPS will ask for the return package. 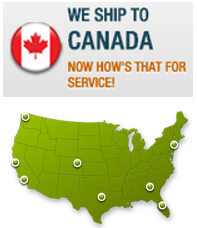 If your order was shipped by truck line, mdwindustrialsupply.com will schedule a truck to pick-up the return item. Carrier will arrive within 5 to 7 business days to pick up the order. Customer is responsible for acceptable repackaging of all returns.